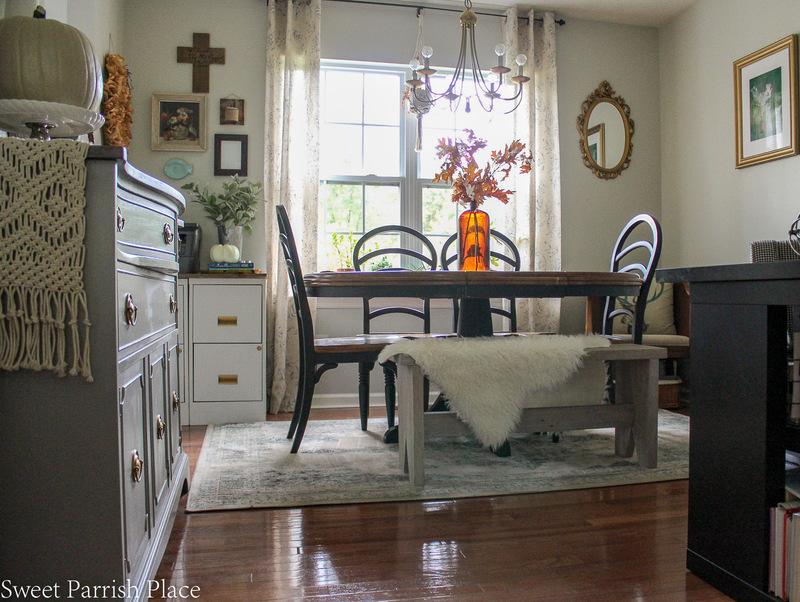 I’m sharing my cozy casual fall home tour today of my living room and dining room/office. Hey friends! 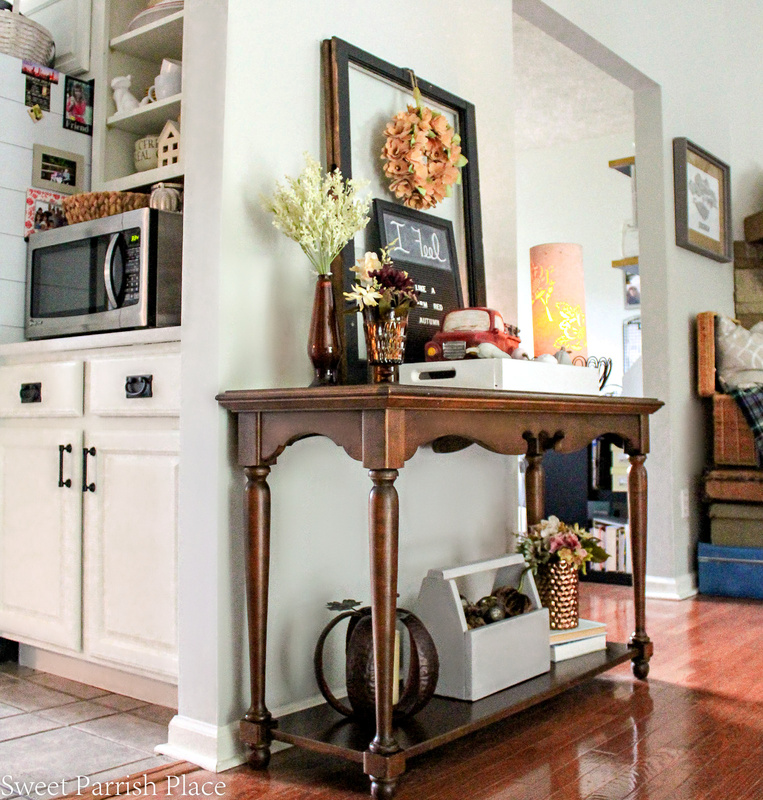 I am still recovering from my One Room Challenge kitchen makeover. Seriously, making over a room on a tight deadline, while working a full time job, is no joke! 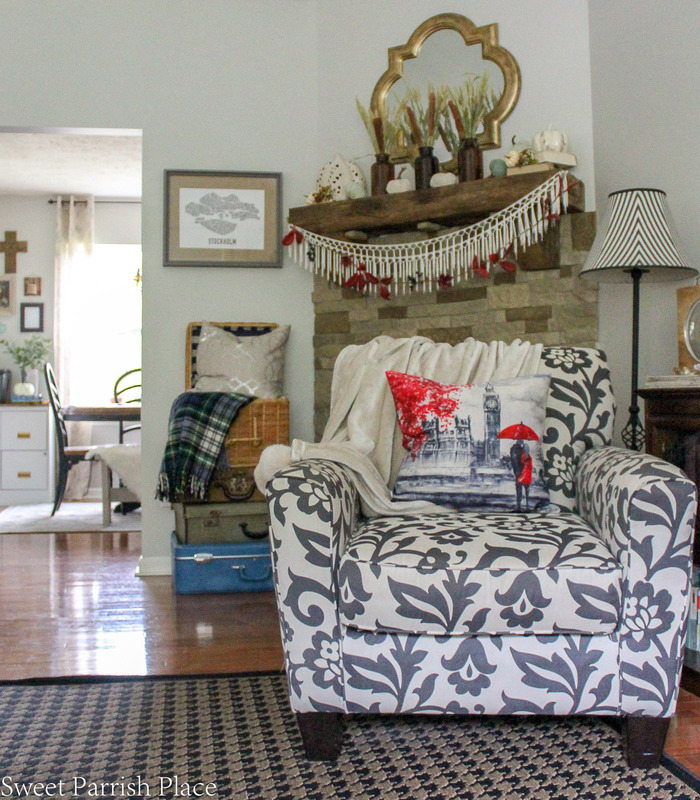 But I am super happy with the finished room, and you can see it right here, in case you missed the reveal last week. 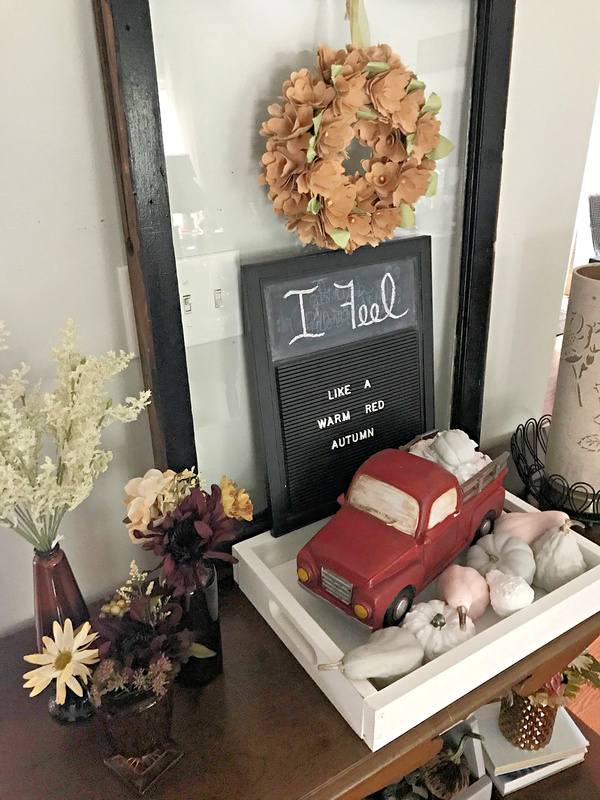 So I decorated my home for Fall, and I even took photographs of it and started to share it with ya’ll. 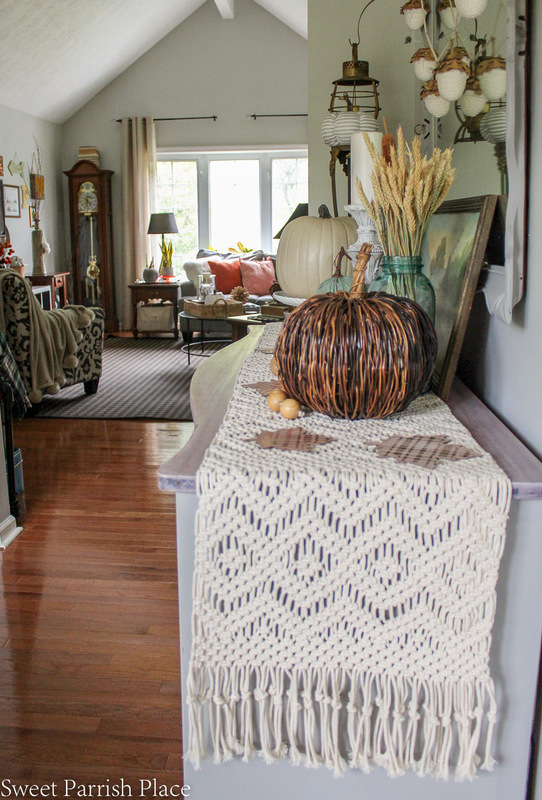 I got as far as my entryway and my fall mantle before the ORC challenge began, and to be honest, I became all consumed in getting it done and photographing and blogging about it, and I never shared my entire fall home tour. I also participated in a Thanksgiving Tablescape Blog Tour last week if you want to check it out. 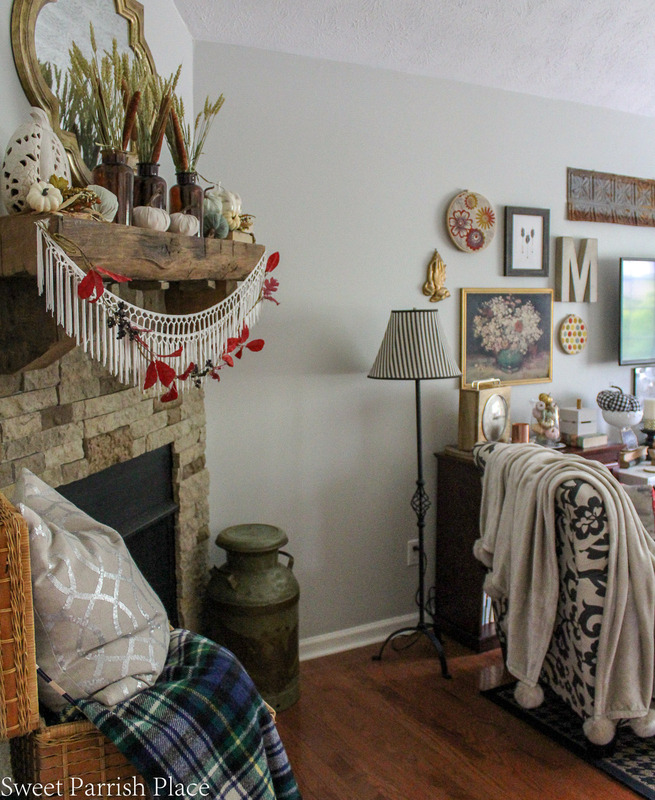 So, before I tear all of my Fall decor down and start decorating for Christmas, I wanted to share the rest of my Fall home tour with you today. This is my living room and my dining room/office. I still wanted to document it on the blog, although it’s a little late, because I can still use this as inspiration for others for the beginning of next Fall. Plus, it still will be on the blog if anyone goes searching for it. 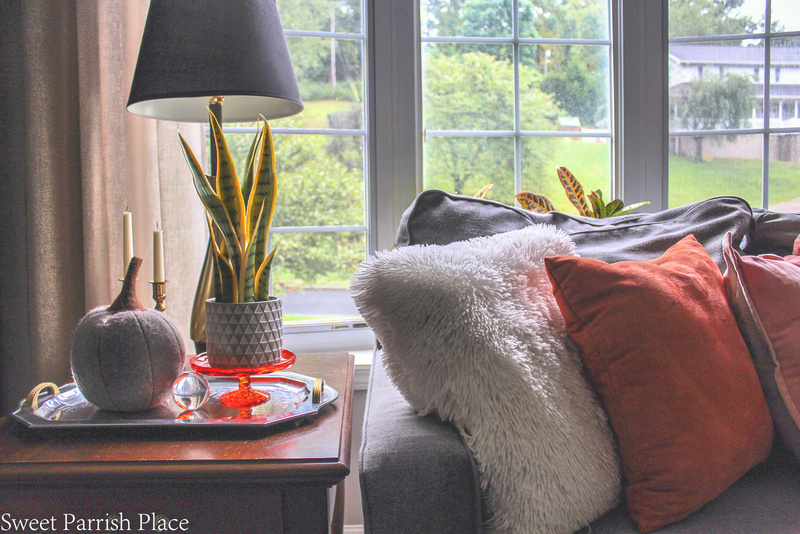 So, pardon me for being so late to the fall decor party, but welcome to my cozy and casual fall home tour! Our living room is where we hang out as a family. We do have a family room downstairs but it really doesn’t get a lot of use, unless all of the kids are home or we have company or guests. 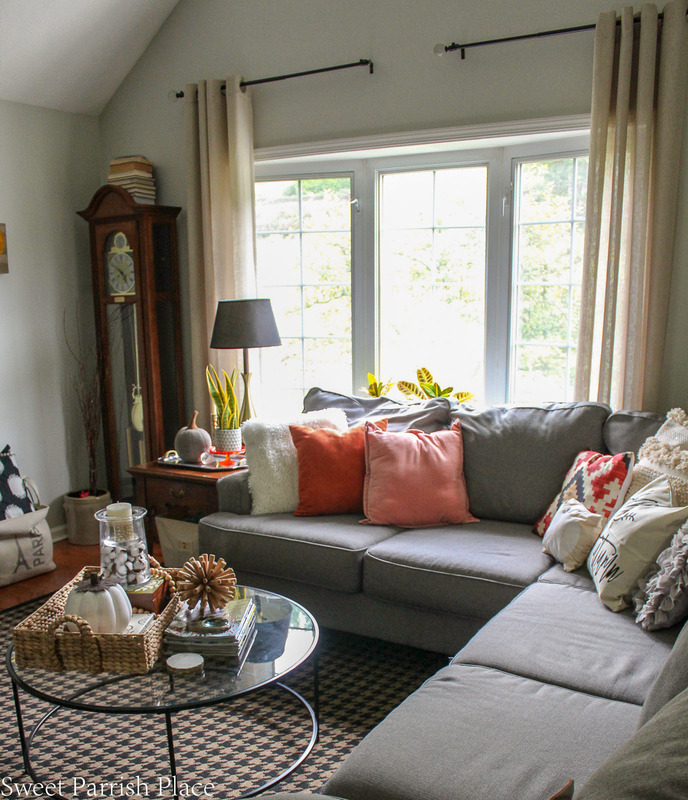 Our living room is where all of the Netflix binge watching and family time happens, so I want this place to be cozy comfy, and casual. I have to say, it sure is making me happy to see this little peek into our newly made over kitchen and see white! I feel like the kitchen makeover really made this living room/dining room/ kitchen space feel so much more cohesive and like everything belongs. This sofa table is right as you top our stairs and turn right towards the living room. I have owned this table and two matching end tables for over 20 years. And they are solid wood pieces of furniture, but I think they might be getting a little makeover of their own soon! I’m hem hawing options in my mind as I write this. The window you see is vintage and I got it from a local home that was being torn down. All I did was clean it up and lean it against the wall here. If you are new here, my style is king of a gathered style of sorts. I love the thrill of the hunt, and I love a lived in and cozy look. I don’t like everything to be all matchy matchy. I want my home to be a collection of different things we love and odds and ends we pick of from interesting places and places we have traveled. To me, that is home. 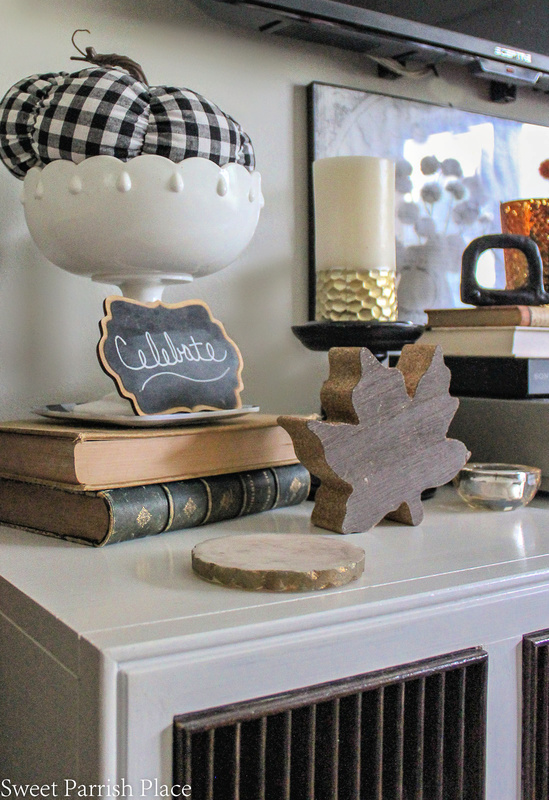 I didn’t purchase a whole lot of new decor for Fall this year, but I did find the wooden leaves and acorn you see in the photo above and below at the Target Dollar Spot and thought they were really cute with the glitter all around the edges. 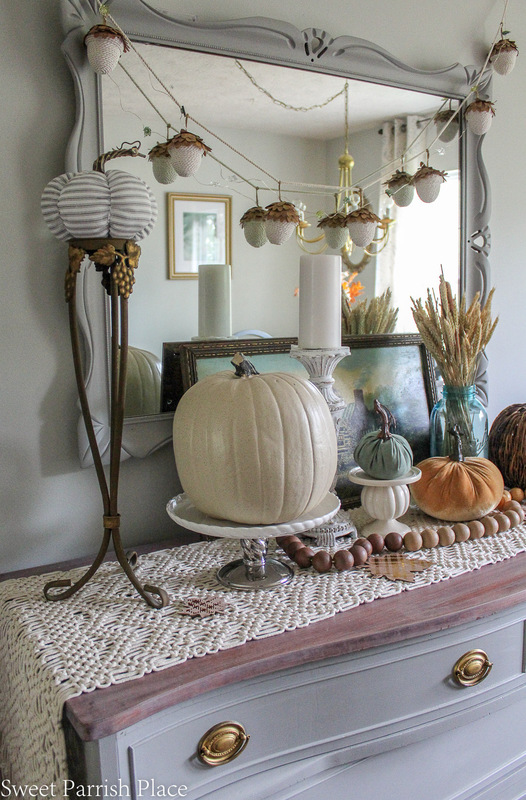 This year, I gathered up all of my faux pumpkins into one spot and painted every single one of them in either grey, white, or blush. 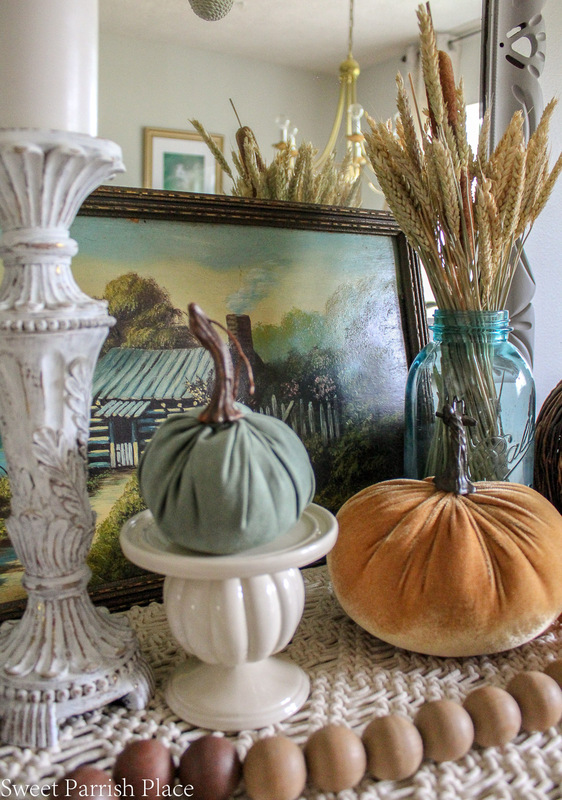 It was fun, I let my son help, and I feel like it made my fall decor more cohesive. I even gave my DIY mini crate pumpkin that I made a couple of years ago a paint job with grey chalk paint. 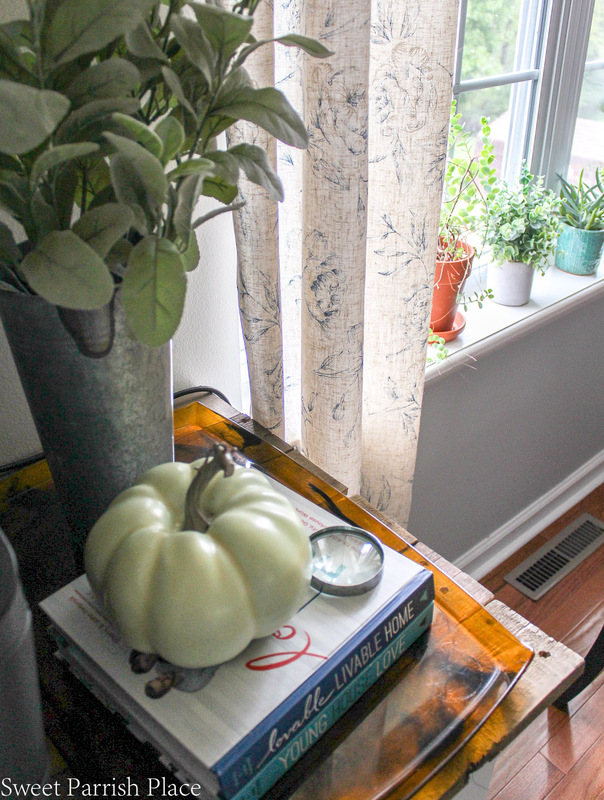 I left a few of the little mini pumpkins you see in this glass vase metallic instead of painting them. It adds a tiny touch of bling. I bought this faux snake plant at Target and it looks so real, you would never know it was fake unless you touched it. The plant peeking from behind the sofa is actually real, and so far I have kept it alive. I found the orange little cake stand at a thrift store years ago, and I always pull it out for fall. The silver tray is also thrifted, and I gave it a tiny makeover by painting the handles a metallic gold. 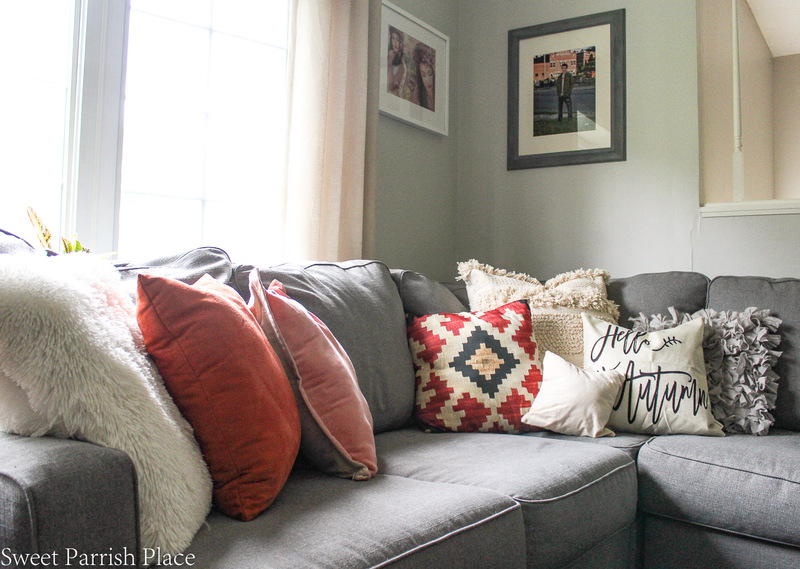 In the fall when temperatures start to cool down, I feel an urge to cozy things up at home, especially in the living room where we hang out and watch TV. 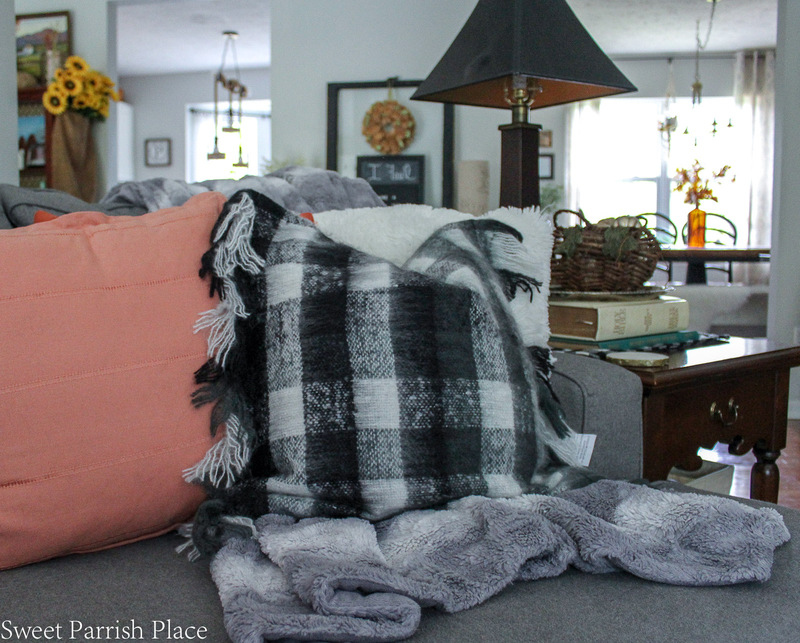 So I love to bring out pillows and pretty throws because it’s like instant cozy to me. 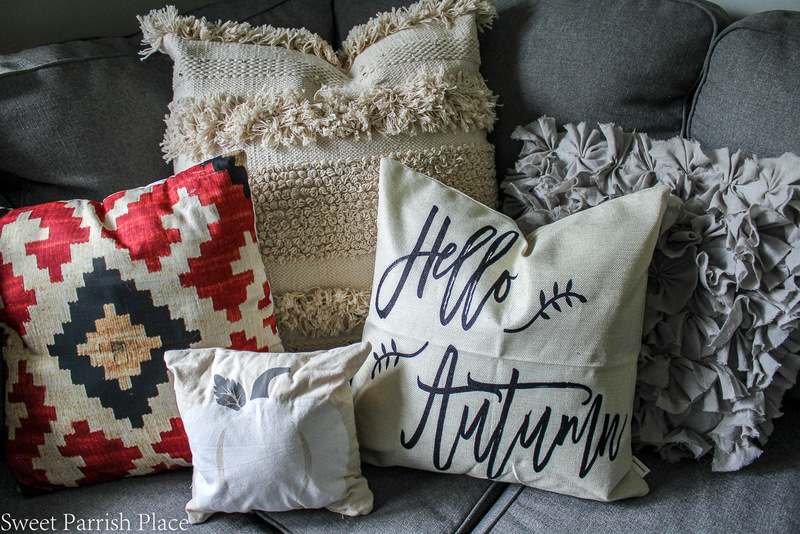 If you wonder how on earth you can store so many different throw pillows for different seasons, the trick is to just purchase pillow covers, and then you can just use pillows you already have and change them out from season to season easily. and the biggest bonus to doing this is you don’t have to find a place to store bulky pillows. You only have to store the covers, and they don’t take up much space at all. Truth be told, I can’t keep pillows on our sofa because our Pug will not stay away from them. If there’s a pillow, he’s chewing on it. And it is very frustrating. So the pretty pillows come out for company and photos. The rest of the time our sofa is covered in dog blankets and that’s it. So there is a little dose of reality for you, ha! 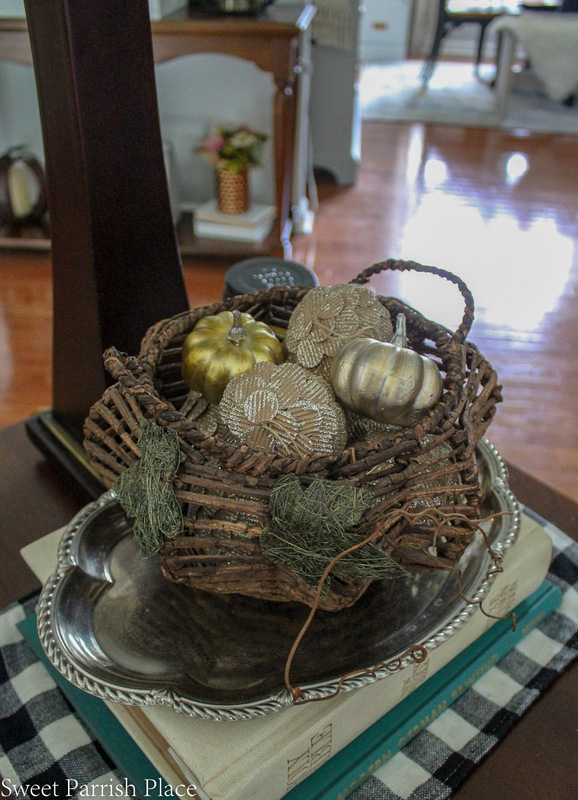 Another thrifted silver tray on top of a couple of vintage books, with a little basket I have had for many years, filled with pumpkins and acorns. 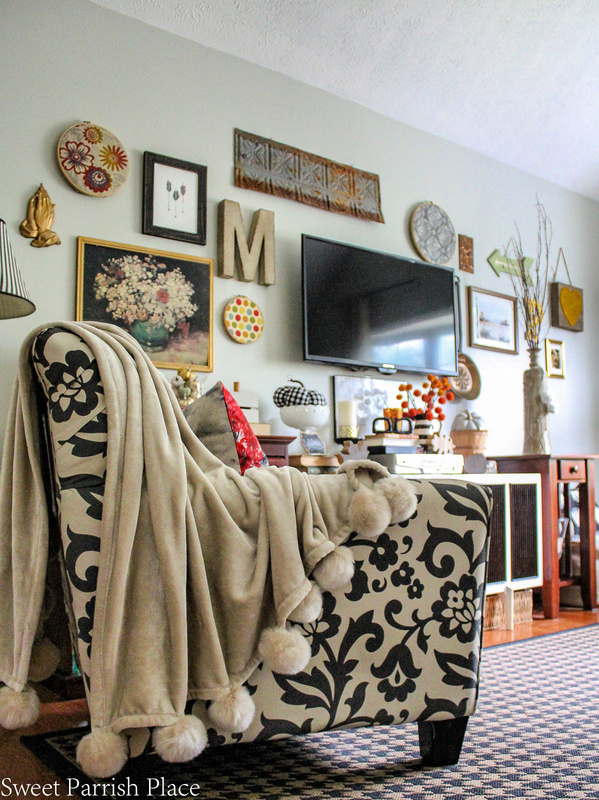 I’m thinking about making a few changes to the gallery wall that surrounds our TV. I don’t plan to completely change it, but there will be a few aspects of it that will be changing soon. I’m thinking of adding some new fabrics to my embroidery hoop wreaths for sure. The grandfather clock you see here belonged to my grandparents. They passed it on to me, and although it doesn’t really fit my style, I will never part with it. I have toyed with the idea of painting it but I have been afraid to do so. But I think I finally have myself talked into painting it because I have been seeing lots of photos lately of similar clocks that have been painted, so I might just go for it. Do you have any opinions on this? I would love to know your thoughts in the comments below. I have also been considering beefing up the draperies in this window. Maybe adding two panels on each side to make them fuller and more voluptuous. Of course, that will require me to purchase completely new ones because I will never find a perfect match to these. Moving on to the dining room/office. This is a very well used room, as it also serves as our home office. You can see the desk peeking out to the right in the photo below. 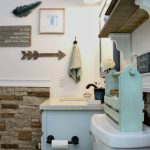 We made over this room for the $100 room challenge last winter. For the most part, it was a very welcome change, but we did have a little mishap with the wallpaper we hung on the wall you see to the right. To put it bluntly, it sucked, big time! And I had to remove it. 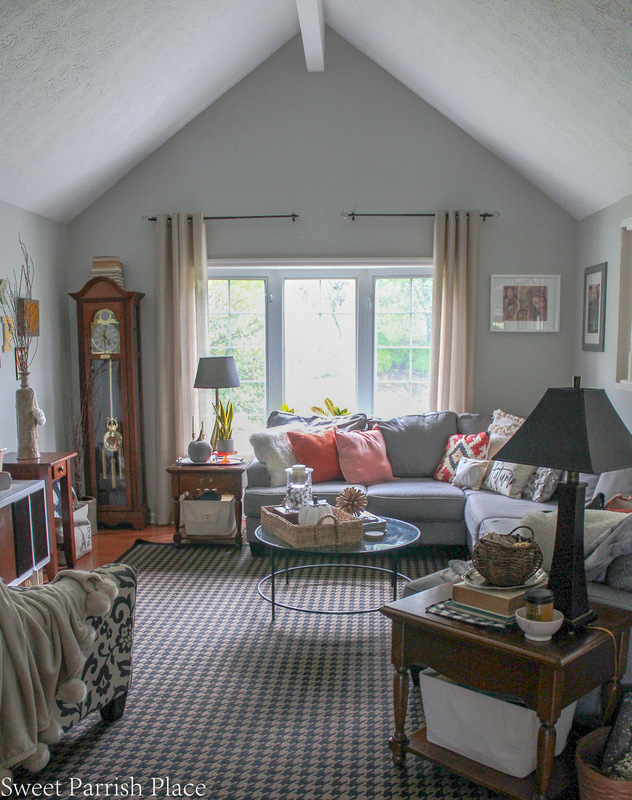 So we just recently painted the wall the same color as the other three, which is Gray Owl by Benjamin Moore. It’s the same color on the walls in the living room, and then the kitchen is also that same color, except I had it lightened by 50%. I still have hopes to make a faux brick accent wall in this room as some point. And I am actually considering making over this space again this year for the $100 room challenge. Which would mean I did the same room two years in a row. But this time I am thinking about making over the table and chairs and the desk and shelves above. I think I can pull it off because the changes in the furniture are going to make it look like a completely different room again. I haven’t made a final decision yet, but that is a thought in my head. 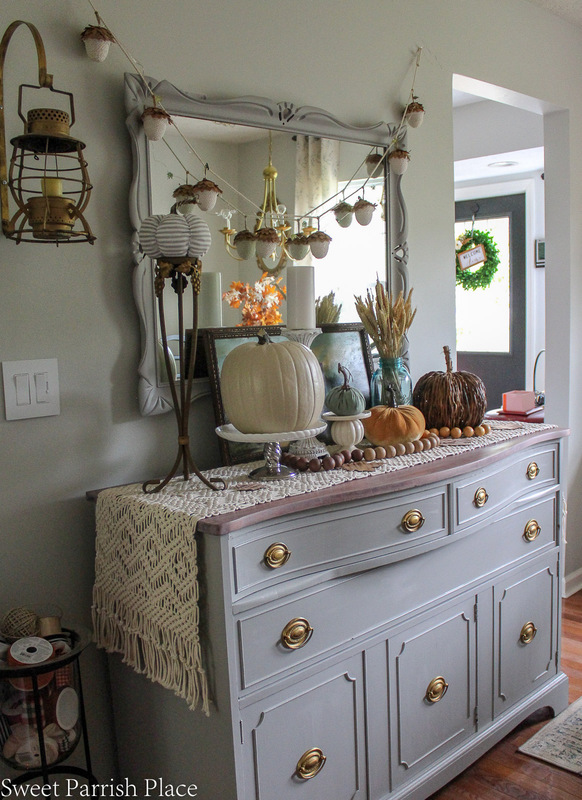 I painted the buffet and matching mirror as part of the $100 room challenge last year. I have owned this set since 1992, and I cannot tell you how much more I love it now that it is painted. It has held up beautifully too. You may have seen my Thanksgiving Tablescape post last week, but that isn’t how my dining table looks on a daily basis. 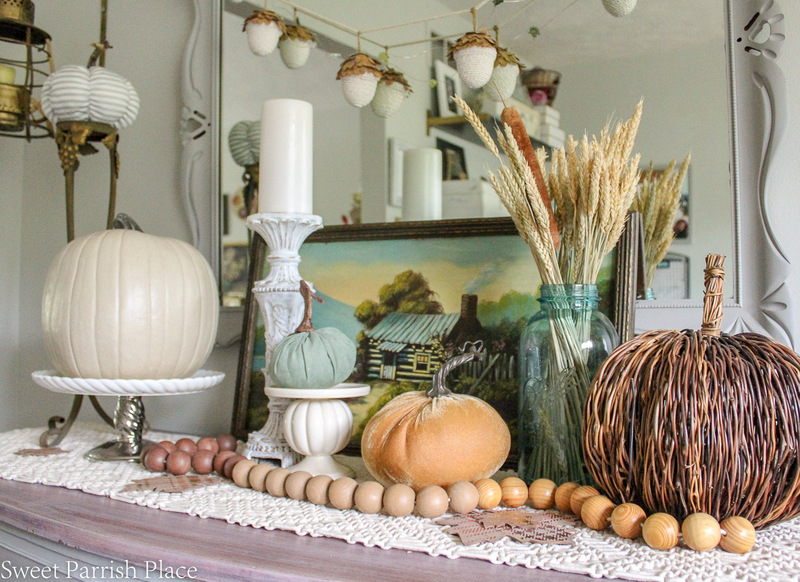 You can see in the photo above, it’s just a simple table runner (which you can’t see) and a vintage amber bottle I found as a thrift store with some fall foliage in it. Simple and easy, this table gets a lot of use, and a lot of papers stacked on it throughout the week, so I need something very uncomplicated. I really loved the way this buffet was decorated this fall. I found the vintage painting you see at a thrift store, and it was the inspiration for the decor on the buffet. I simply love this painting! 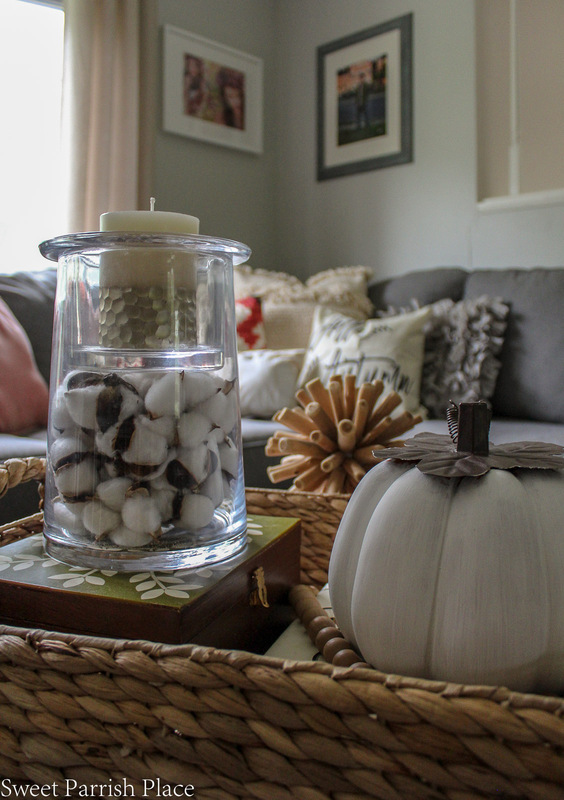 Adding some dried wheat to a jar or vase is a simple way to bring some fall into your home. I bought a big bunch of it at Hobby Lobby, and spread it around in a couple of different spots. 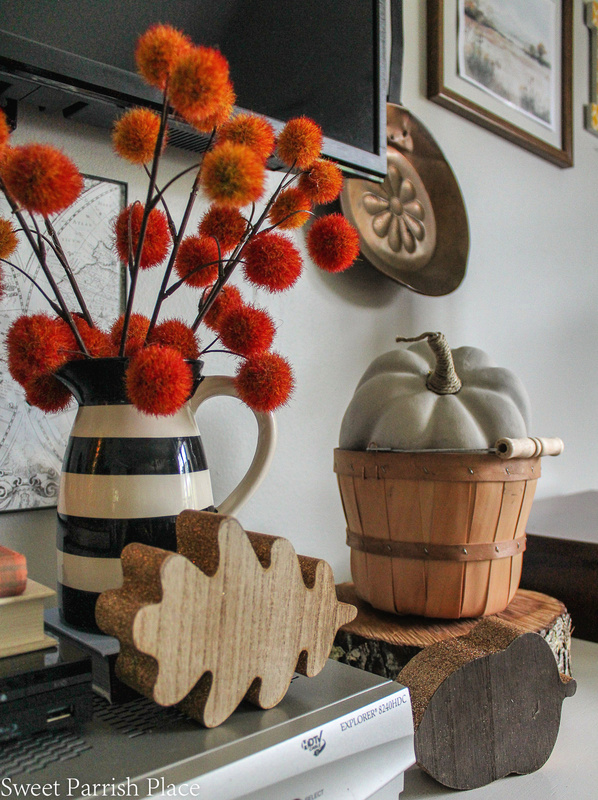 I didn’t do much else in the dining room/office other than scatter around a few pumpkins, because you can never have enough of those, right? 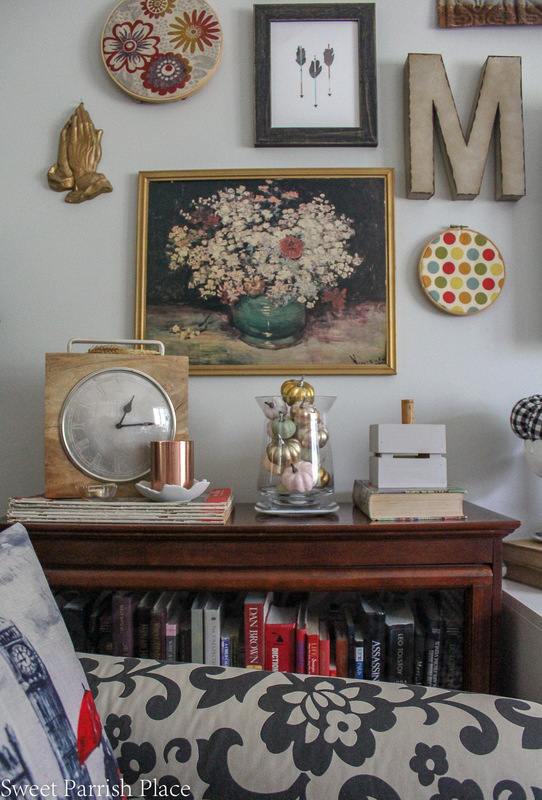 You can see a little peek at the rustic top I added to these thrifted file cabinets. It is my attempt at making these necessary cabinets look like furniture. 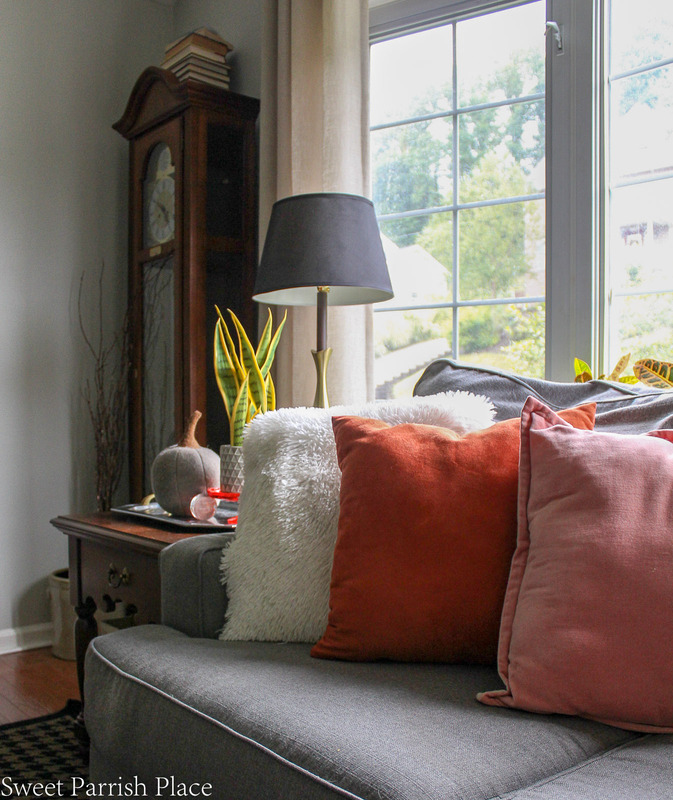 If you stuck around to see my cozy casual fall home tour today, thank you so very much! I apologize that this post is coming out practically after the fact. But I really wanted my 2018 Fall tour to be on here for future reference. 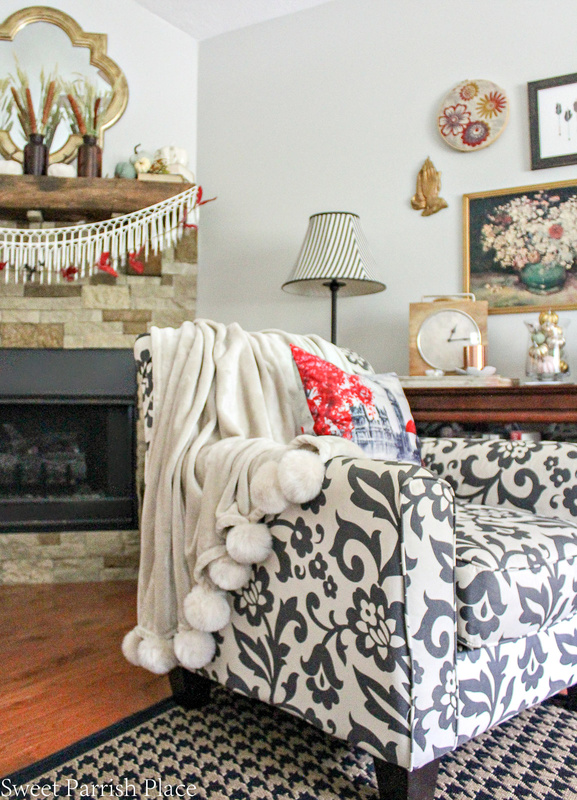 So, have you thought about decorating for Christmas yet? I have been thinking about it, and I even went shopping over the weekend and bought some Christmas decor at Hobby Lobby. But I won’t actually start decorating until next week when I am off for Thanksgiving Break. And I will be collaborating with a group of fabulous bloggers during the week of Dec. 3-7 to bring you a whole week of amazing Christmas inspiration. So mark you calendars because you won’t want to miss it! Nicki, your home is beautiful. You put all the colors and textures together so well. The room looks cozy and welcoming. Thank you so much Stacey! and thanks for reading my Fall post although it is a little late in the game! I love all of the words you just used to describe my home. Thank you so much!